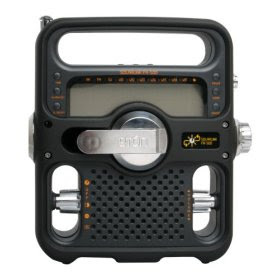 Pretty nice radio, just what I need for my Bug out Bag or just around the house. Just may have to count up some change and purchase one or two. Yeah, I have the older version and it has been working great for several years. It's very sensitive, too. But this one has the added features of weather channel, solar panel (my older one only has the hand crank), LED instead of incandescent light, and digital display, which is very helpful for tuning in a specific shortwave station. Oh, and I forgot the ability to charge cellphones and such. although I try to avoid relying upon devices that can break down and be difficult to repair, this is a sound investment. I might buy a couple - one for the car, one for the home.